Industrialisation has been a boon for us in so many ways. But we’re paying a heavy price for it, as well. 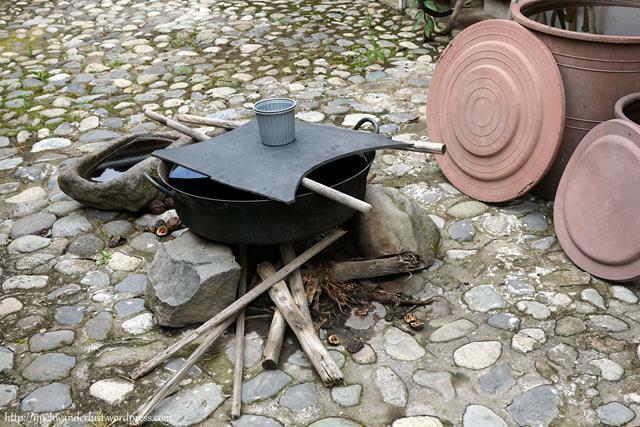 All over the world, age-old traditional ways of doing things – by hand, from scratch – have been slowly forgotten. 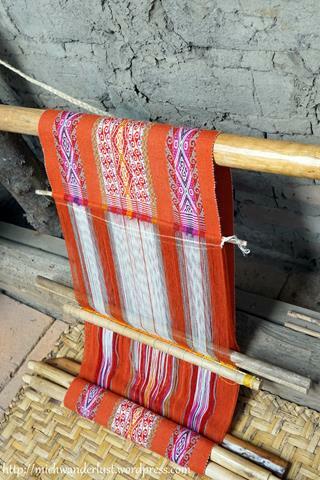 Backstrap weaving is one of these dying crafts. This art has been practised for thousands of years, and it’s not just indigenous to Ecuador. 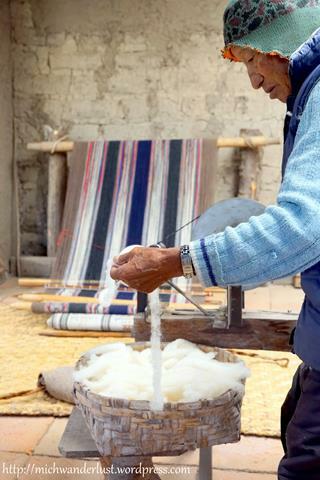 You can also find backstrap weavers practising the craft passed down from their ancestors from Guatemala to Peru. I’ve even seen it in a rural community in Thailand! I’ve seen how they weave on this and it takes ages! It takes them an entire day to make a single belt, but they say that the quality is better than those made using European-style weaving looms. The latter were introduced to Ecuador during the Spanish conquest and have remained in vogue since. For one, it’s a lot faster to make things on those looms than the traditional backstrap looms. 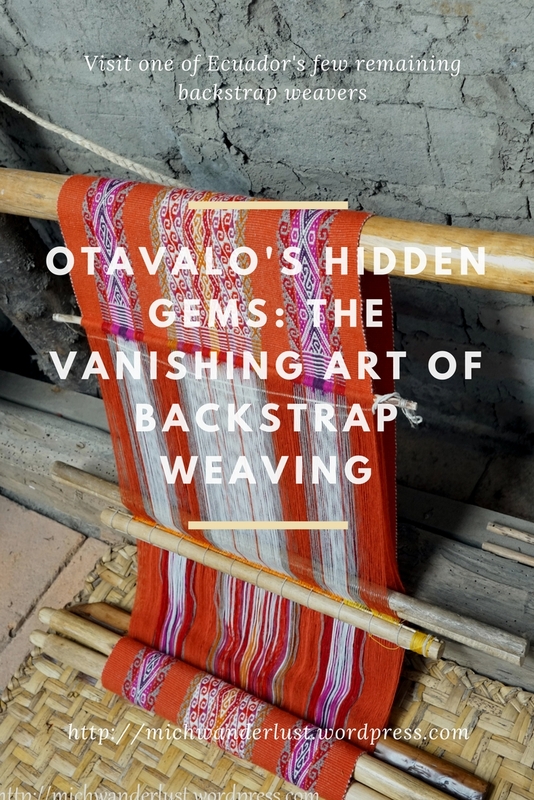 So the number of backstrap weavers in Ecuador has been dwindling over the years, and now just a handful remain. One of these is Miguel Andrango, who lives in the Agato community just outside Otavalo. 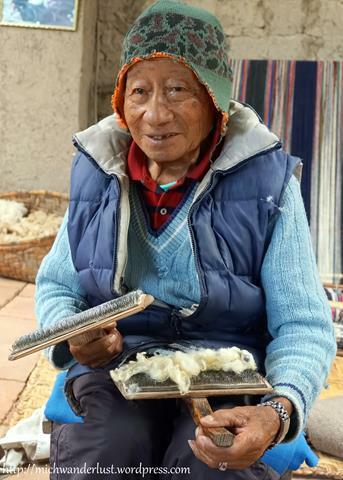 Miguel is quite a well-known backstrap weaver and has made many international trips to promote and teach this ancient art – you can see old newspaper cutouts from the local papers wherever he went. However, he stopped travelling in recent years as his wife’s health was declining and he stayed home to take care of her. Sadly, she passed away last year. He’s now 84 and when we spoke to him, it was clear that he misses her very much. Still, he continues working on his lifelong passion, with the help of his children and some other villagers. He also gives tours of his weaving workshop, which are completely free. I’d first read about him from simpletravelourway, and reading the rave reviews on TripAdvisor only cemented my desire to visit. Arranging the visit was easy. We simply emailed to arrange a time, and caught a cab from our hosteria directly to his workshop (the driver knew where it was). The workshop tour is a fascinating look into how a woven garment is made, starting all the way from unspun wool. 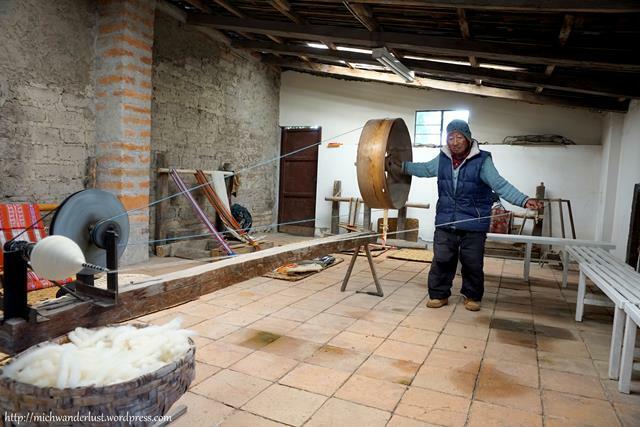 They do everything themselves, from cleaning the wool, spinning it, dyeing it, and finally weaving it. 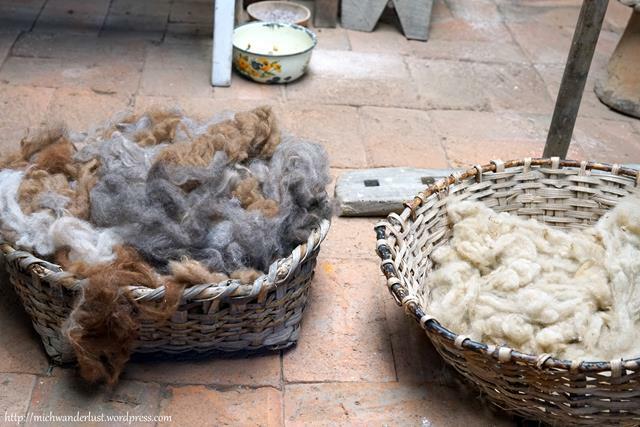 Miguel started by showing us unspun wool – alpaca on the left, sheep on the right. Alpaca wool is noticeably softer than sheep wool, and is supposed to be warmer too. Next, he showed us how they card the wool. This is done to clean and disentangle the wool and make it into a thin layer suitable for spinning. I tried my hand at carding and it’s more difficult than it looks! Too much pressure and the wool sticks to the implement and clumps up, too little and it’s ineffective. Up next: spinning! First he draws out a long strand of wool and then uses the machine to spin it onto the spindle. Spinning wool is traditionally a woman’s job, while weaving is a man’s, but in this particular workshop, at least, they’re quite egalitarian. Everyone can do everything. 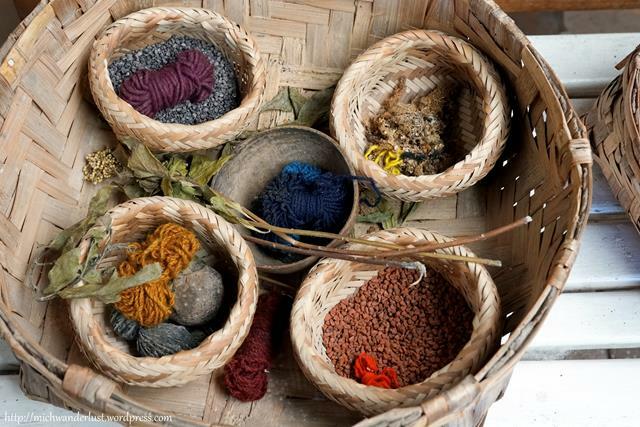 Their dyes are made in the traditional way, from all-natural sources. The purple dye, for example, is made from an insect. To turn it red, just add some lemon. And did you know that walnuts can be used to create dyes too? It’s a yellow-brown kind of colour. Below is part of a blanket, which takes about 2 months(!) to complete. Outside, he showed us where the dyes are made. They generally involve boiling for a very long time. In the little shop you can purchase the stuff they make right here. I was surprised by the sheer variety of what they had on sale – cushion covers, ponchos, jackets, socks, gloves, tapestries… the list goes on. I ended up buying quite a bit more than I’d anticipated – a poncho and a jacket for $45 each, $6 gloves and a pin-cushion for $10. Luckily, they accept credit cards! It’s a bit pricier than Museo Otavalango, but they do have a much wider variety of stuff. And looking at the amount of work that goes into a single garment, I don’t think the price is unjustified. It’s also easy to understand why this art is dying out, precisely because of the amount of work involved. But there is still hope! 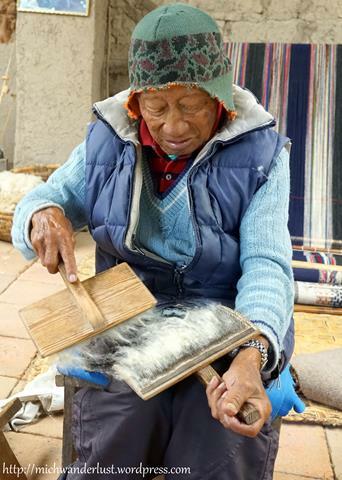 We met Miguel’s daughter, Luz Maria, who is also a weaver. 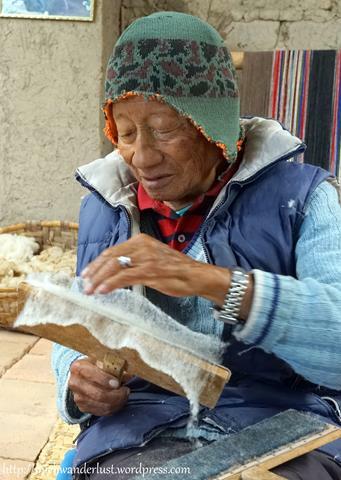 She proudly told us about her grandson, a 5th-generation weaver who was in Canada to give a weaving demonstration. It was very heartening to learn that there’s significant international interest in this ancient art. Perhaps this speaks to a wider trend of people turning away from mass-produced goods to more exclusive, bespoke products – as evidenced by the increasing popularity of things like bread machines, specialty coffee and craft beer. It gives me hope that vanishing arts such as backstrap weaving can yet be saved from complete extinction. 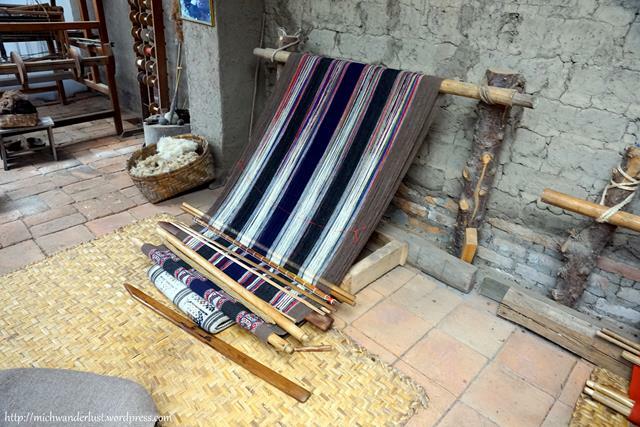 So if you’re ever in Otavalo, why not visit Miguel’s workshop? Apart from the fascinating insight into backstrap weaving, I can tell you from personal experience that the jackets will keep you warm and toasty on freezing Andean nights! How to get there: A cab from Otavalo cost us $5. You can also take a local bus to Agato and ask around for directions to the workshop. To get back, Luz Maria kindly waited with us opposite the workshop for a bus going back to Otavalo. They come quite regularly so it wasn’t much of a wait. 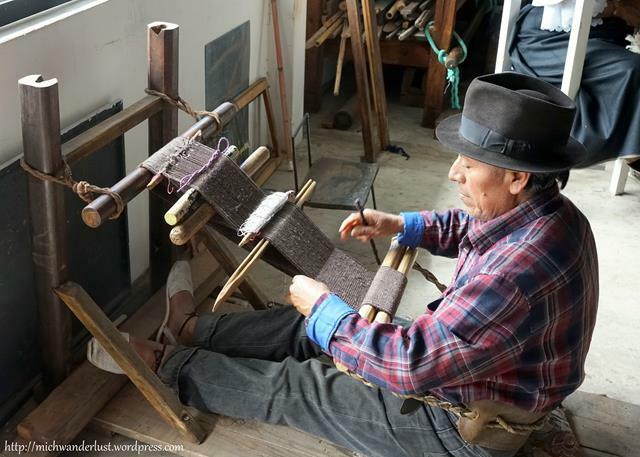 Have you ever seen backstrap weavers in action? Where? So glad you got a chance to visit! It was one of the best memories we have from our trip to Ecuador. What a talented, warm, and gracious man. Totally agree! And thanks for the recommendation. Wouldn’t have heard about it otherwise! Skills like these are phenomenal. I once attended a weaving demonstration in Oaxaca and was amazed at what it takes to complete a work. Some of them take months and have to be completed by one weaver (another person will weave different and ruin the piece). I only have admiration for people who keep this art alive. Me too! It takes immense dedication and I don’t think they get paid very well for their time. Thanks for stopping by, Ruth! Wow that is quite the process. I am impressed they are not more expensive given all the time that goes into it. And sad to hear that his wife died, but glad he is still working on his craft. I just don’t see future generations doing it, unfortunately, but maybe I am wrong. Thanks for sharing on #TheWeeklyPostcard. Yeah, I understand – it doesn’t pay very well at all I imagine, for all the time needed to produce a single item. There are far easier ways to make a living today. Still, I hope this craft survives! Thanks for stopping by, Anisa! Oh my, that is so interesting to see. The work and energy that goes into brings a whole lot of respect, for sure. I visited a weaver’s in Fez, Morocco and was just completely blown away! Wow, they do backstrap weaving in Morocco as well? That’s awesome. So glad there are still people practising this art all around the world 🙂 Thanks for stopping by, Esther! Wow it’s quite an interesting process, and the and results are beautiful (that blanket – wow)! I’m glad his daughter and her grandson are both weavers and will hopefully continue this art and pass their knowledge and techniques to others as well. This was fascinating! 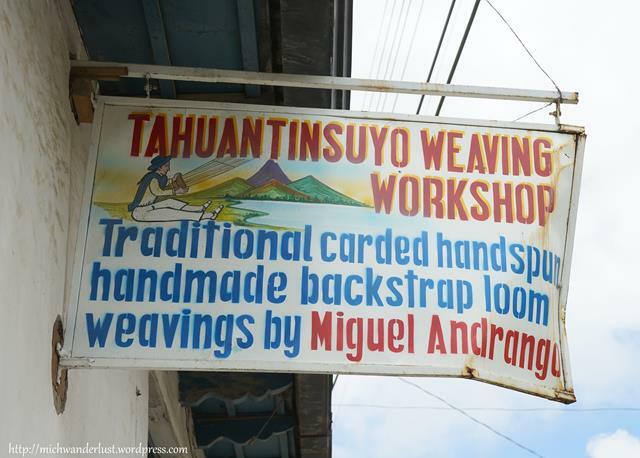 I certainly would want to see Migule’s backstrap weaving if I get to Otavalo. It’s so nice tor read about historical, cultural things such as this that don’t get enough attention! Very fascinating to learn about the history and how they weave! Thanks for linking up with #TheWeeklyPostcard! So interesting Michelle. I didn’t know that insects could be used to make dye colours. wonderful to see the traditional craft is still practised and can hopefully be passed down to the next generation. Yup, my sentiments exactly. Thanks for stopping by, Sally! This was a great article. I support andean textiles. Handmade is always the best option in the long run. Hey Suzette! So sorry for the super late reply (which is what happens when you neglect your blog for months on end! )… if you’ve already been, how did you like it?? Hope you had a great time! Ecuador is such a great country, isn’t it?